100% FHA! Conventional 1% down mortgage + 2% down payment assistance! What are Low Down Payment, First Time Home Buyer Programs 2019? What are the low down payment mortgage and first time home buyer programs available in 2019? VA still offers 100%, zero-down financing. But what if you’re not a Veteran? A Conventional, 1% down payment mortgage. The lender contributes the remaining 2% in down payment assistance to reach the 3% minimum down for a conventional loan. 100% FHA Financing – no down payment required! How do you determine which option is best? The 1% down mortgage really breaks the mold when it comes to the first time home buyer programs – it’s the only option where the lender contributes 2% down payment assistance. The remaining of this article will cover comparing 3.5 down FHA loan versus 3 down Conventional loan. For more information on the 1 down mortgage, see: 1% Down Mortgage. Calculate your options using our Down Payment Calculator. A minimum 3 down mortgage versus 3.5% down isn’t a huge difference; but if you’re short on funds when you’re purchasing a home, the extra 3% interested-party-contributions for a FHA loan (including the Seller) really helps toward the closing costs! FHA allows up to 6% contributions versus Conventional’s 3% allowed contributions with the minimum down-payment. Most noteworthy, if you’re working with a Mortgage Broker that offers you a credit for the interest rate chosen (like MLS Mortgage Group), the credit usually ends up being a little higher with a FHA loan. Larger Credit = Less Cash-to-Close. Even though FHA mortgage rates are lower on average. Be careful not to equate lower interest rates with savings – when you include the upfront MI premium, it effectively raises the rate. For a quick comparison, check out the Mortgage APR to see the actualized cost. FHA charges mortgage insurance upfront and monthly. The upfront premium is usually added on to your base loan amount to lessen the amount to bring to closing. If you’re putting less than 10% down on an FHA loan, you’ll be paying mortgage insurance until the loan is paid off. If you put more than 10% down, you have the option to cancel the insurance after 11 years. On the other hand, with a Conventional loan, you have the opportunity to remove the mortgage insurance after the home appreciates. It will cancel automatically if you pay the principal down to 78% LTV or if values increase, you may have the option to get an appraisal to prove the home’s value to remove the mortgage insurance earlier. We did a comparison between the two minimum low down payment mortgage loans and the differences were astounding. In the scenario of a $250k loan with a 740 credit score, the difference ended up being over $42k more over 30 years if you went with the FHA loan compared to the Conventional loan. If you think you’ll be staying in the home so it has a chance to appreciate or you may be making additional payments to your principal balance, it’s definitely worth checking out Conventional financing. Conventional mortgages also have the option of no MI via lender-paid MI. Both a FHA loan and Conventional loan offer Home Improvement or Renovation loans. The main difference between those two low down payment mortgage options is the FHA loan allows their standard 96.5% loan-to-value versus 95% LTV for a Conventional loan. One of the biggest differences between a FHA loan and Conventional loan are the credit requirements. Currently, we have access to FHA financing with credit scores down to 500. That does require 10% down; if you want the minimum 3.5% down, your credit will need to be at least 580. There are Conventional loan down payment mortgage options for as low as 620 with 3% down. The biggest differences at the lower scores are the costs involved between higher interest rates and mortgage insurance. 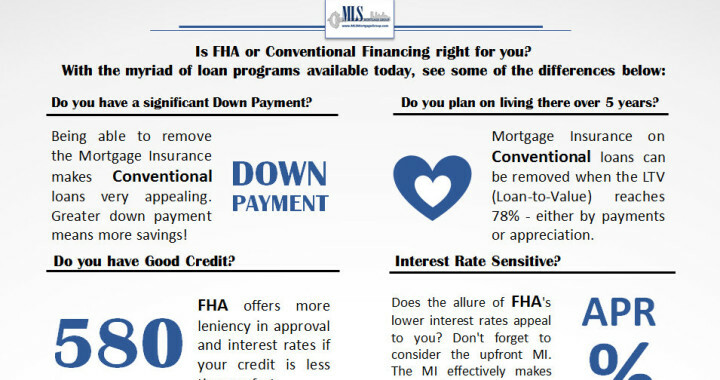 Which is best – a FHA loan or a Conventional Loan? If you have good credit, down payment, and plan to keep your home for an extended time, then a Conventional loan may be a better fit for you. If your credit has some imperfections, a FHA loan may be the better low down mortgage option. View current loan down payment mortgage – FHA mortgage rates (and Conventional) here. With the myriad of difference and possibilities, the best way to truly figure out the best option for you is to consult a Mortgage Loan Originator. An experienced professional will review your specific situation and supporting documentation to present low down mortgage options to you. Then you will be able to review your personalized options and make an informed decision. We are based out of Minneapolis, MN and are happy to assist anyone planning on purchasing a home in Minnesota. Feel free to contact us for an obligation-free consultation to explore personalized low down payment mortgage options. Posted in Buying a House, Credit, FHA Loan, First Time Home Buyer, Mortgage, Mortgage Questions and tagged Conventional Loan, Down Payment Assistance, First Time Home Buyer MN, first time home buyer programs, first time home buyer programs 2017, first time home buyer programs 2018, low down payment mortgage. An impressive share, I just given this onto a colleague who was doing a little analysis on this. And he in fact bought me breakfast because I found it for him.. smile. So let me reword that: Thanks for the treat! But yeah Thanks for spending the time to discuss this, I feel strongly about it and love reading more on this topic. Big thumb up for this blog post! Great Article, Eric. Covered every single thing about this exceptional first time home buyer loan program. The most complete and thorough piece i have found on web. Keep the good work up. Thanks for this write up Eric, it’s a nice write up on information. The infographic of FHA vs Conventional financing is a nice touch and the end up sums things up nice and simple for those who need some help deciding.